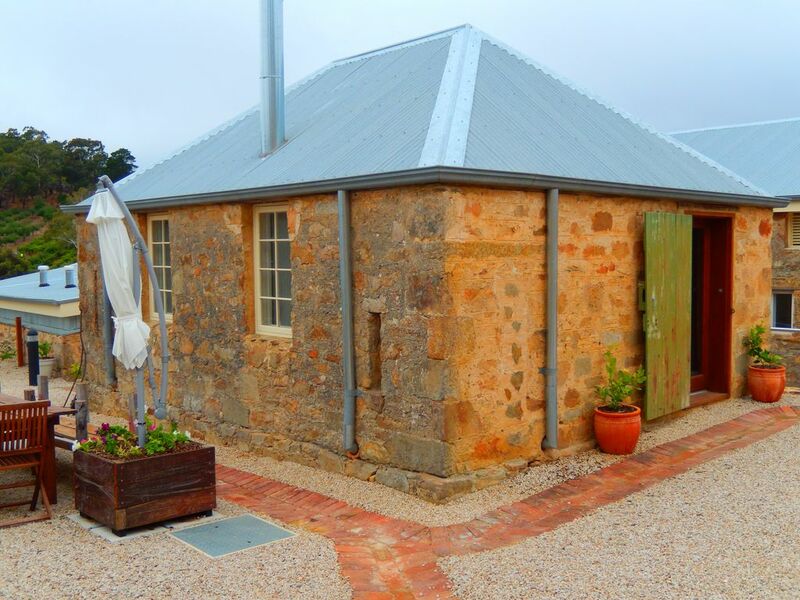 Venture just twenty minutes from the City of Adelaide into the beautiful Adelaide Hills and you can find the State Heritage listed Morialta Barns. The Barns were built around 1847 by John Baker, the second premier of South Australia, as part of his Morialta House Estate at Norton Summit. After falling into disrepair they have recently been undergoing restoration and conversion to bed and breakfast accommodation and we are now ready to welcome guests to the property. The Barns are located on an eight acre property where they sit on the side of a picturesque valley overlooking the Fourth Creek as it winds its way down towards the Morialta Falls. Both the Heysen and Yurrebilla Trails pass through the property on their way either into the Morialta Conservation Park or across to Mount Lofty and beyond. The Barns can accommodate up to eight guests in three separate buildings. The Well Room has accommodation for two guests; The Loft has accommodation for two guests; and The Bakery can accommodate up to four additional guests. Any group size from one to eight will be able to stay at The Barns, so if you are a smaller group you don’t need to book the entire property but if you have a larger group you can still enjoy your own space. All three buildings have direct access onto the private walled courtyard where you can relax and enjoy the rustic heritage surrounds and views across the valley. Perhaps with a glass of local wine and a game of petanque (boules) prior to dinner with friends in the courtyard, or maybe before a short stroll up the Heysen Trail to the Scenic Hotel for dinner with sunset views across the city to the coast. The Well Room is a beautiful little building sitting on it’s own on the edge of the courtyard. Although small, accommodating up to two guests, what it lacks in size is more than made up for in character. A beautiful ensuite includes luxury amenities, the slow combustion wood heater provides more than enough warmth and the fridge will be stocked with supplies for a continental breakfast for your first morning. Stay for two or more nights and you will receive a complimentary bottle of wine from one of our local vineyards. If you’re visiting for one of Adelaide’s great festivals or events The Barns are only twenty minutes from the city; or if you need to take a break from the city you can enjoy the tranquillity of The Barns maybe using them as a base to explore other local towns and regions such as Stirling, Hahndorf or even the Barossa. The owners, who live separately on the property, are available if required to provide local knowledge or help make special arrangements. So whether you’re looking for a quiet break on a long journey; an indulgent escape; a romantic getaway; a family holiday in The Hills; or even if you have no reason at all, your stay at Morialta Barns will make the occasion just that little bit extra special. We had a delightful stay. Our hosts were incredibly accommodating. The apartment was equipped with everything we could possibly need. The history of the property is fascinating. We would highly recommend this property! Beautiful quiet place with great hosts helping you explore the hills. The Koalas on the property were a treat for sure really up and close. Quick access to everything to help explore the area. Clean, and breakfast provided was sufficient with access to BBQ for evening cooking if necessary. Local pubs were great !!! Was cool even with the extreme heat and having the fan was a welcome item. Absolutely perfect getaway! Such a gorgeous location! Loved the little details like fresh bread on arrival. Steve & Fiona have undertaken a huge task in restoring the barn complex. A real credit to their commitment and determination to bring back to life a very important part of South Australian history. The accommodation was spotless and the bed was so comfy. Everything that we needed (and more!) was at hand. The fire heated up the room very quickly and really gave an ambient feeling that just made our stay perfect. The Heyson trail skirts a corner of the property so those keen walkers also have a bonus at hand. Steve was very knowledgeable in regards to the history of the Barns and was more than willing to share this information of not only the Barns but the surrounding area. Certainly one of the top places that we have utilized on our travels. I highly recommend this accommodation and wish Steve and Fiona all the best in their continuing restoration of other areas within this complex. We spent 3 wonderful nights here to celebrate our wedding anniversary and it was just perfect. The hosts were very friendly and have thought of everything. The restoration of the barn has resulted in total charm but with modern comforts. One our first night we enjoyed a lovely bottle of Pinot that was left for us by our wood fire. On our second evening the owner even had an outdoor fire pit burning for us after our dinner out. We got some great advice by the owner about walking trails and with all the native flowers in bloom, we enjoyed quite a few strolls in the surrounding area. We can’t rate this place, and the hosts, highly enough. It was just perfect!